Today would be a good day to speak about the Blessed Sacrament. The Gospel, as we say, “pre-figures” the way in which our Lord would make the substance of His Body and Blood present to thousands and even millions of people throughout the world under the appearances of bread and wine. The event took place during the Passover, one year before the Last Supper. It was the occasion on which our Lord promised that He would give us His Body and Blood; and told us that it was necessary for us to eat and drink Them if we were have the life of God within us. It is also quite clear from this account that our Lord meant that the Blessed Sacrament would be more than a symbol; that it would really and truly be His actual Body and Blood. Even then there were people who doubted Him—disciples who left Him; contradicting this idea of the Real Presence—it was just too much for them to understand how Jesus could do such a thing. And our Lord had to simply let them go. He didn't call them back to say that He didn't mean what He said, because He did mean it. He didn’t say that they had misunderstood—He didn’t say that He had been speaking figuratively or symbolically—He was, in fact, speaking of His body and blood in reality. But, you can read the entire account for yourself in the sixth chapter of Saint John's Gospel—and I would like to ask you to do just that—it's only one short chapter, but well worth reading. Indeed, it would be a good idea to read it over and over as time passes. Maybe you will be able to read it today. At first glance, the healing of Saint Peter's mother-in-law doesn't seem particularly unusual. We read in the Gospels that our Lord healed a great many people, and it's not too surprising that He would have taken special care of the family members of His close disciples. (He may have been softening up Peter's wife, so that she would let Him out of the house to preach the Gospel to all nations.) In the time of our Lord, without modern medicine, a fever might actually prove fatal. So this was a great healing. But Saint Ambrose, the fifth century archbishop of Milan, says that the fever can also be thought of in a symbolic sense. He writes that we are often afflicted with spiritual fevers—that we sometimes find ourselves burning up with fevers like lust, and greed, and hatred, and intemperance, and other such passions—and, that of our own, we are unable to cure these fevers. Our intentions, and our fasting, and our self-discipline are good, but they are not enough. 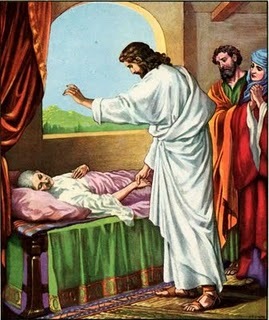 Just like Peter's mother-in-law, we require our Lord's help to overcome our fevers. And that help—the “living water” that would quench the spiritual fevers and bring everlasting life—was what our Lord promised the Samaritan woman at the well in Friday's Gospel. Now, the Samaritans were outcasts, and most Jews wouldn't have anything to do with them. Although the Samaritans practiced the Jewish religion, were foreigners who had been introduced into Israel after the Assyrians had taken the Jews from the Northern Kingdom into captivity. And this particular lady was a sinner—she'd been through five husbands and was on her sixth, and he wasn't really her husband anyway. But the scripture implies that this meeting with our Lord converted her. In fact, not only did it convert her, but it made her a disciple, preaching about Jesus to her Samaritan friends. And, the “living water” that He promised to her is available to all of us. Figuratively, it is the stream of water that came forth out of His side, pouring out of His Sacred Heart, opened by the soldier's lance, as He hung on the Cross. Literally, it is prayer and the Sacraments. For only with these can we hope to extinguish our passions, to cool our spiritual fevers, and to go on doing the will of God. We need to unite our will with God's will in prayer. It is absolutely essential that we obtain Sanctifying grace through Baptism—that we nourish this grace through Holy Communion—that we restore it by a good Confession if we should lose it—that we augment this grace throughout our lives by receiving the other Sacraments at the appropriate times. Finally, in the same Gospel, our Lord speaks of having nourishment from a food that even His disciples didn't know about. And, He says that “that food is to do the will of He who sent Him, and to accomplish His work.” And, likewise, that food is available to us. There has to be a practical dimension to our Faith—which starts with, but goes beyond prayer and the Sacraments. We can be nourished by doing God's will and furthering His work in this world. These Gospels, then, are a rich source of instruction for us: By ourselves, we are often unable to cure the fevers which arise from human passion. But our Lord has given us “living water,” a stream of love from His Sacred Heart. And we must go down and drink from that sacred stream of prayers and Sacraments—and likewise, we must eat the food of doing God's will and work.